Are You a Queen Bee? Then Walk Like One! We hope you are all enjoying the summer, but you know it won’t be long before we’re back in our fall routines (have you seen the “Back to School” sales already???). Once we’re home from vacation and the kids are in classes, it’s time to think about a new routine for yourself—getting in shape for the Queen Bee Virtual 4-Miler. Many of you participated in last year’s Queen Bee Virtual event, enough, in fact, that the Flying Pig Marathon, the organizer of the Queen Bee, was able to present the Patty Brisben Foundation with a check for more than $10,000! That’s a lot of steps, and you made the gift possible by being part of the Queen Bee. For those of you who might not be familiar with it, it’s easy, fun and a great team-building experience for your group. First, sign up at here to be part of the Queen Bee. Then, because it’s a virtual race, you can do a four-mile walk any time you want to—you can do it in bits and pieces, you can do it all at once, you can do it on a treadmill, around your neighborhood or at the park. Any place you can walk, you can get your miles in! You can also RSVP and connect with other walkers to stay motivated on the Queen Bee event page! Last year many of our Pure Romance Queen Bees made an event out of t he walk—they got friends and family members to sign up, headed to the park for a picnic, then walked the miles! Others got their teams together and made a day of it (with a happy hour afterwards!). However you do it, it’s easy and fun to do, and it’s a great way to get back into a healthy routine. The actual Queen Bee 4-Miler and Half Marathon will be held in our home town of Cincinnati on Saturday, October 13, so we’d like you to sign up and complete your miles before the event. 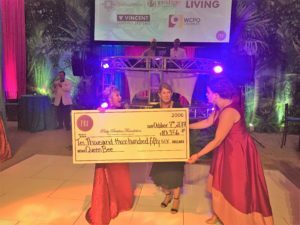 That evening is our annual Gala where the Flying Pig will present the donation that YOU have made possible by being part of the Virtual Queen Bee! As you know, the Patty Brisben Foundation for Women’s Sexual Health directs resources and funding research to advocate for women’s sexual health and advance the understanding of the issues facing women’s sexuality. We have funded projects and grants around the world, and it’s because of your generosity and we’re able to do so. So enjoy your time off this summer but once you get back, don’t forget to include the Virtual Queen Bee as part of your regular routine. And we’ll see you out on your walk!